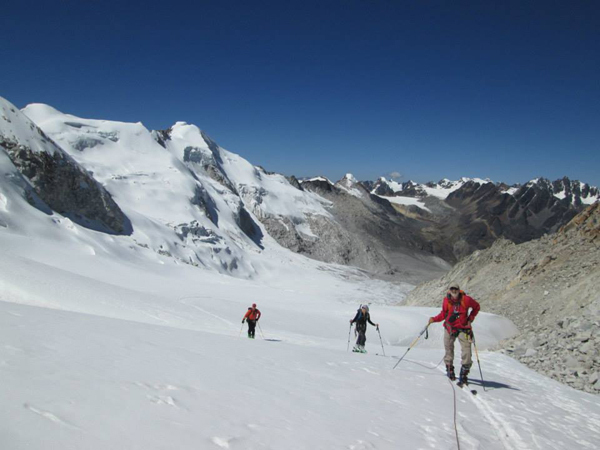 This page has details of some of ANDES previous successful 'First Ascents' expeditions, as well as other innovative itineraries we have run over the last twenty years. See our Calendar page for details of unusual and interesting expeditions coming up in the next year or so. For details of our "Argentina Unclimbed" expedition scheduled for December 2018 click here. 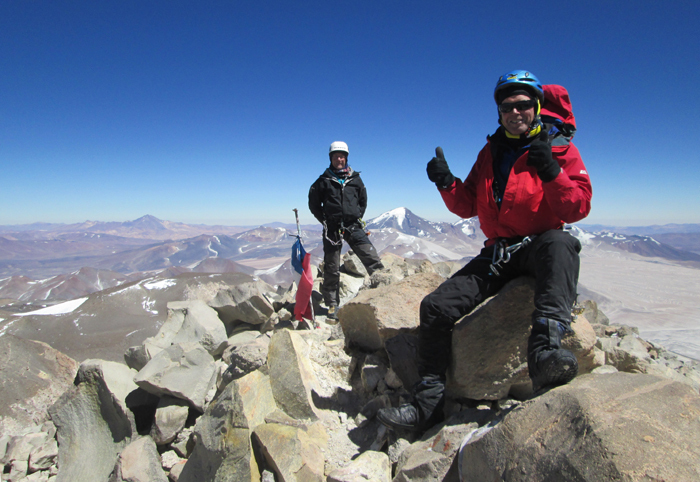 On the summit of Vicuñorco, 5910m, Sierra Laguna Blanca, Argentina. Our 2018 Argentina Unclimbed expedition was on the whole very successful, reaching three 5000m+ summits and one over 6000m. 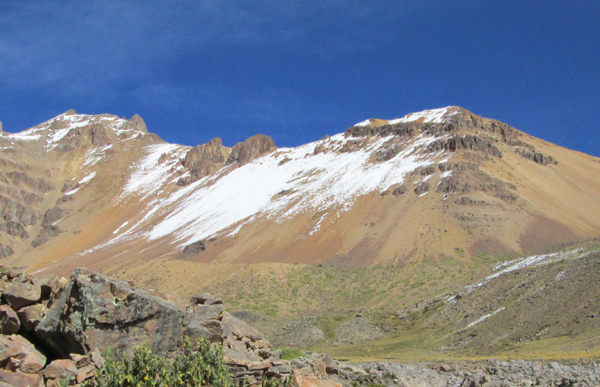 However the target for our first ascent, Cerro Vicuñorco (aka Laguna Blanca Norte) turned out to have been climbed two separate local climbing groups just the season before (November 2017 and February 2018). pipped at the post! Our March 2016 trip to the Puna de Atacama of Argentina and Chile was very successful, with almost all of our clients making all of the summits we attempted. 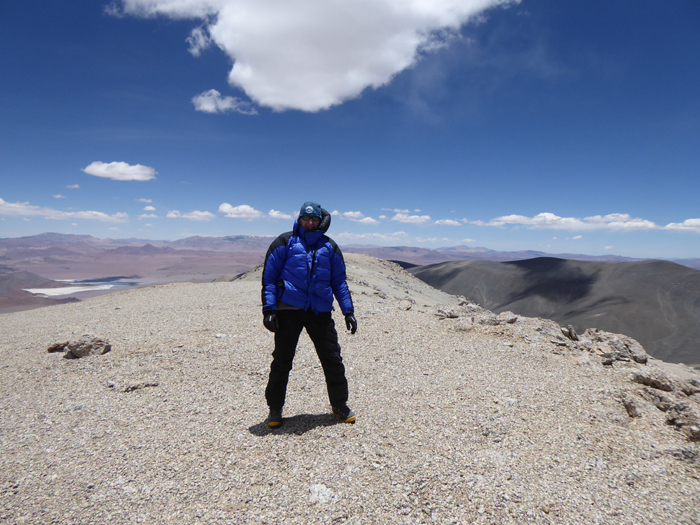 We climbed Laguna Blanca Sur 5912m, Laguna Blanca main peak 6012m and also the South Summit of Laguna Blanca main at 6001m. 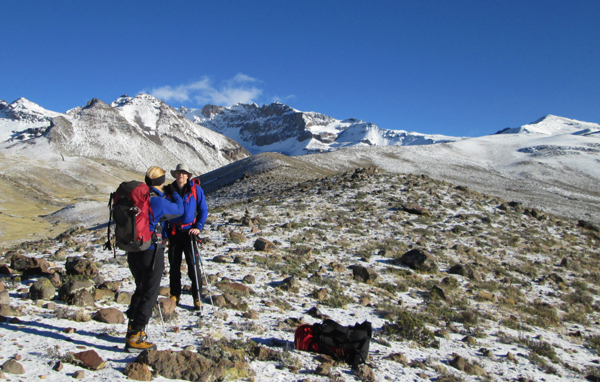 Finally three of us went on to climb the worlds highest volcano, Ojos del Salado, 6893m. 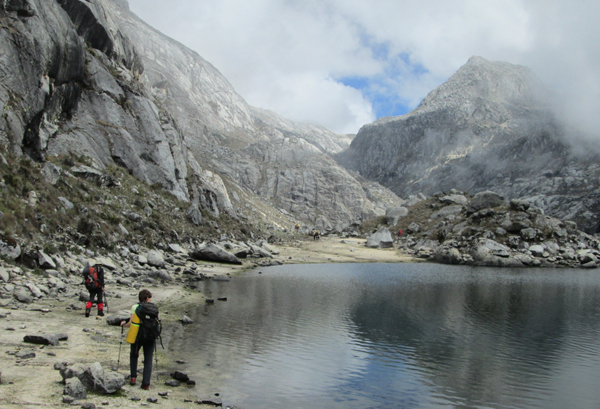 However we were looking for unclimbed peaks in the Laguna Blanca massif, and in this we were less successful. 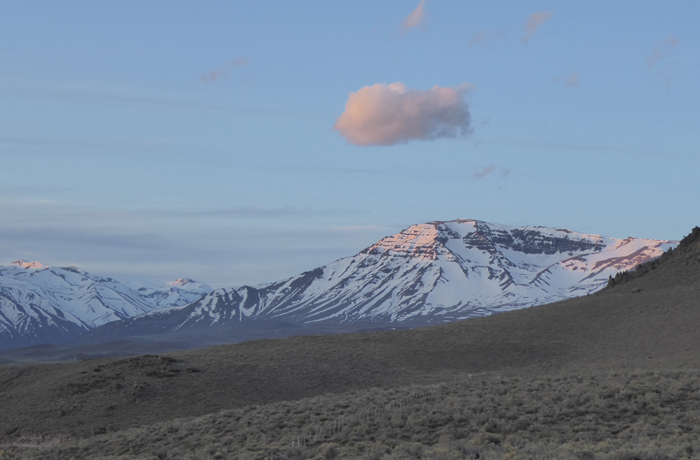 We found records on both the possible unclimbed summits we climbed that indicated others had been there before us. In both cases they thought they were on the highest peak in the range! To be fair, there were also Inca ruins and firewood on both of these summits, including a huge 6m x 12m burial platform at 6001m on Laguna Blanca South Summit, so we could only ever have made a first modern ascent. 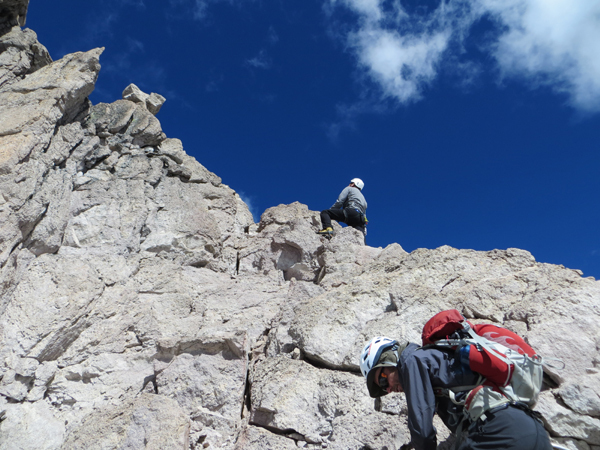 Approaching the high camp on our first big peak, Laguna Blanca Sur. A pile of Inca firewood on the summit of Laguna Blanca Sur, 5912m. 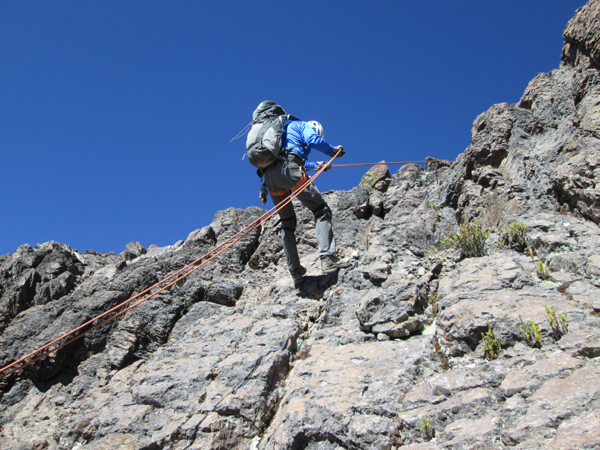 Inca platform on Laguna Blanca (south summit) 6001m. 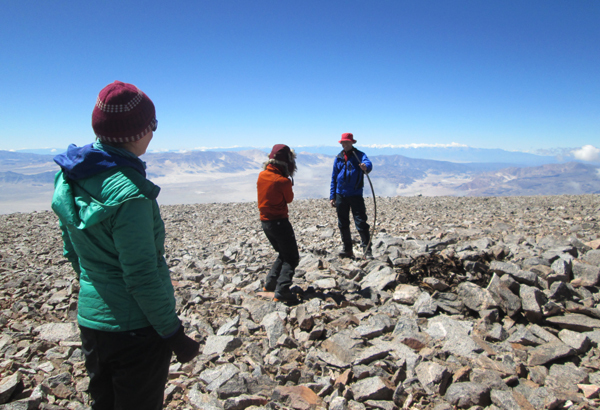 Clients on the summit of Ojos del Salado, March 2016. The twin peaks of Pico Colon and Pico Bolivar lie in the north of Colombia just 45km from the Caribbean Sea. They are the highest peaks in the Sierra Nevada de Santa Marta. 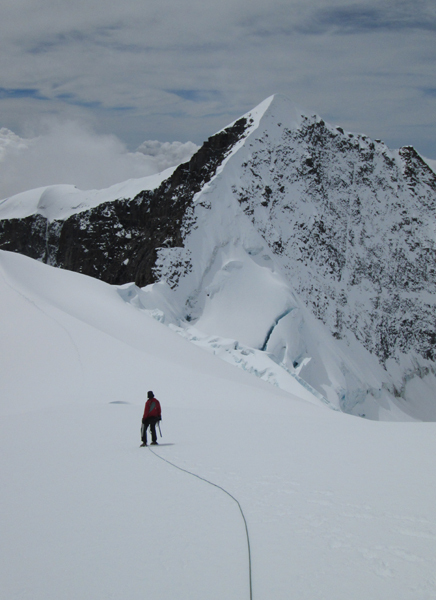 Unfortunately safe and unrestricted access to these mountains is very hard to get at the moment, although an ANDES trip did get in and make an ascent of Pico Colon in December 2015. 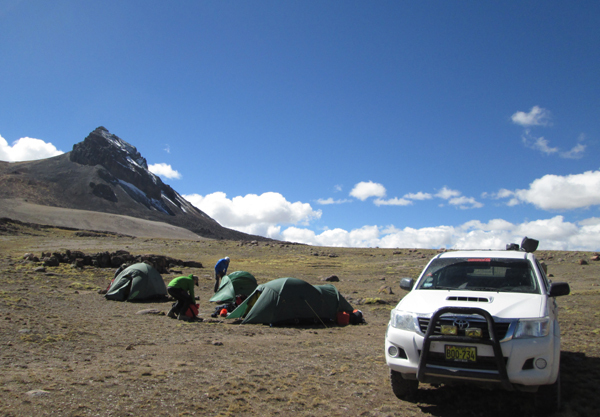 Our December 2015 trip began with nearly a week of trekking through Kogui indian lands, starting at 1000m above sea level and finishing near the snow line at 4950m. Regrettably we only had time to climb Pico Colon, but even this was a major achievement as it appears to have been climbed very few times in the last 30 years. The route was relatively easy, a glacier climb with some snow to 45º. 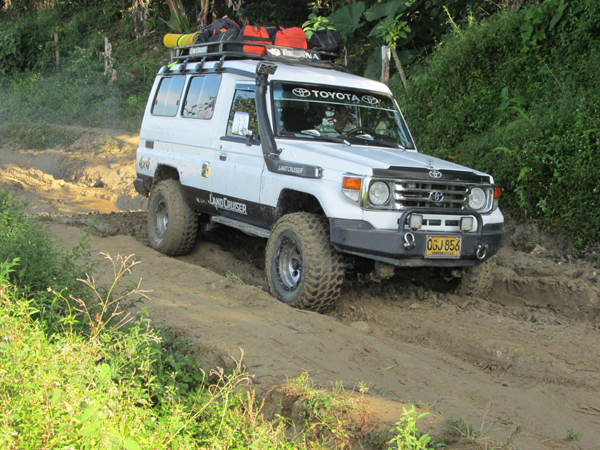 Approaching the mountains by Landcruiser. 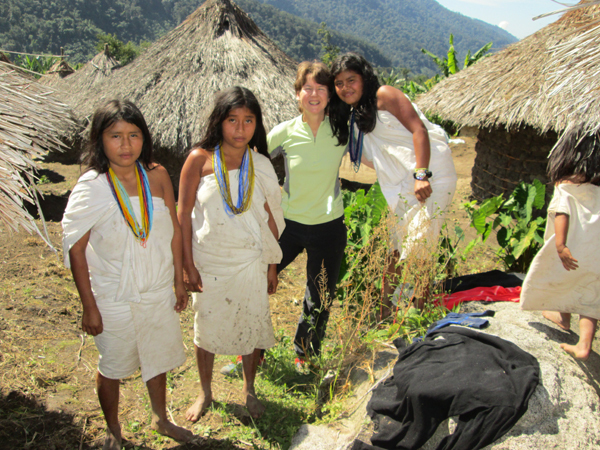 Kogui indian villagers... always keen on a selfie. 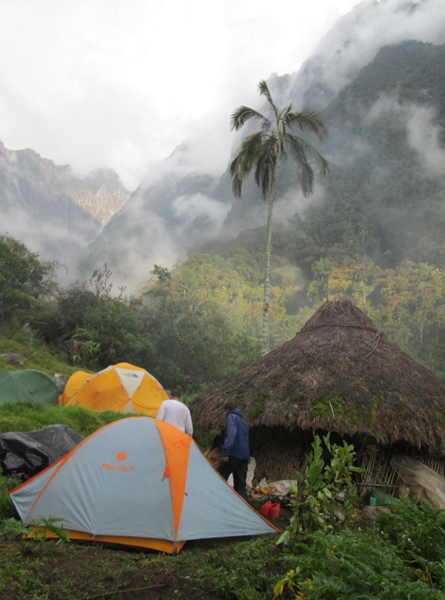 Rainforest camp at 2300m in the Sierra Nevada de Santa Marta. Approach trek, Sierra Nevada de Santa Marta. Approaching Lago Nautendan, Sierra Nevada de Santa Marta. 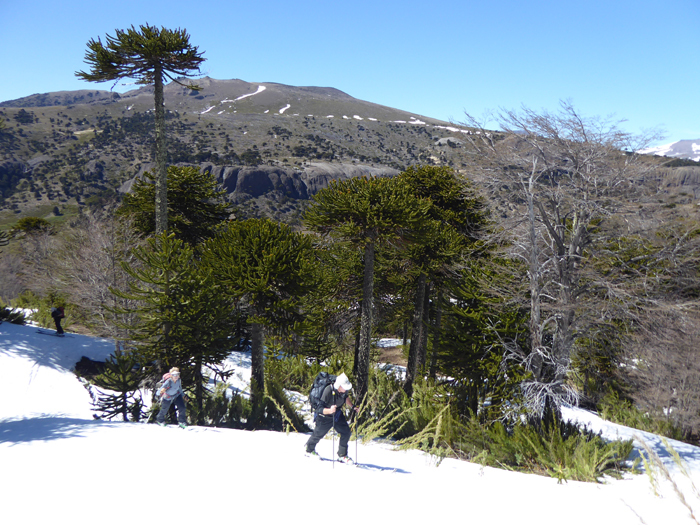 Above is a picture of Bolivar and Colon (on the left) from near the high camp on the north side of the mountains. 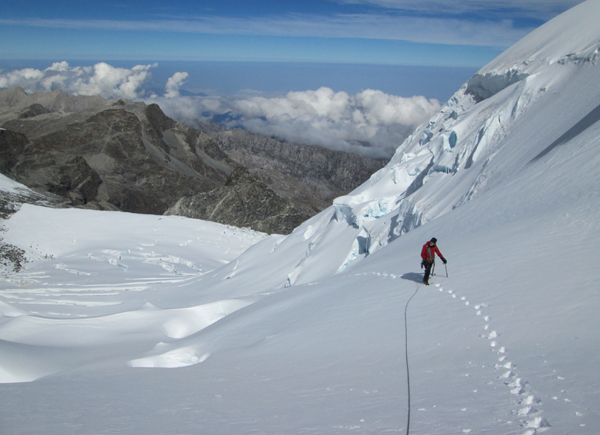 Climbing the NW glacier couloir on Pico Colon, Colombia. Petter on the summit of Pico Colon. Pico La Reina can just be made out through the cloud to the right of the climbers knee. Pico Bolivar seen from high up on Pico Colon. The twin peaks of Pico Colon and Pico Bolivar are the highest peaks in the Sierra Nevada de Santa Marta. 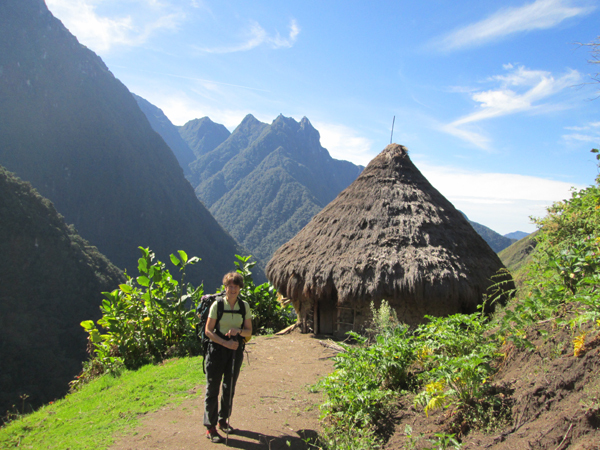 Our June 2015 First Ascents trip to southern Peru was very successful. We were based out of the city of Arequipa and climbed mainly in the remote Cordillera Huanzo, making 2 or 3 first ascents and climbing a total of five 5000m+ peaks in a week. 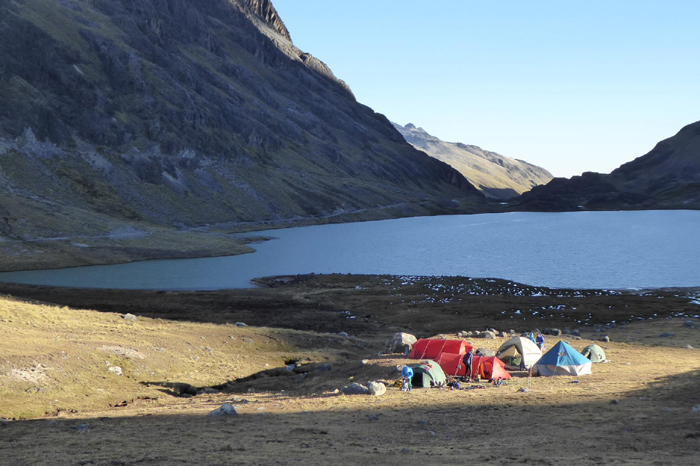 Our first camp in the Cordillera Huanzo, beneath the peak of Condorillo. 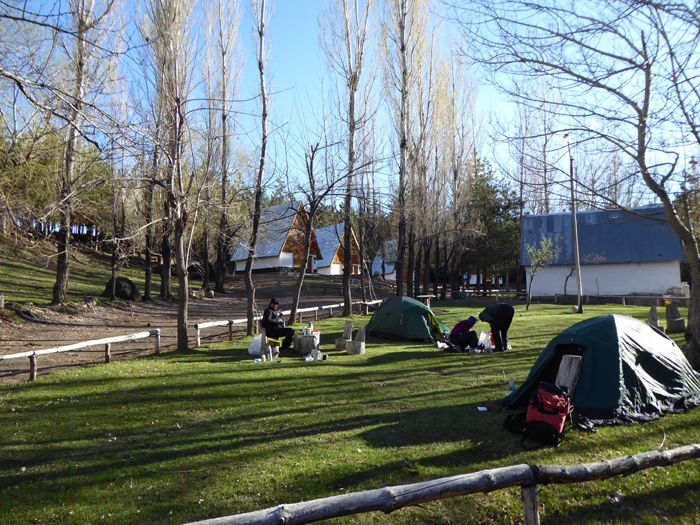 Our scenic base camp in the Khara Khota valley. 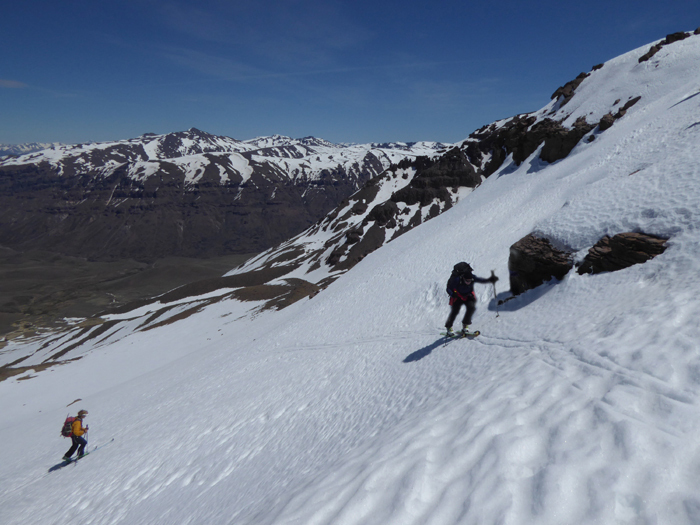 Skiing on Jishka Pata, day three. Two days earlier we had skiied the peak on the left, Janco Huyo. Myself on the summit of Jishka Pata (5508m), with Lindy. Thanks to David Roberts for the picture. 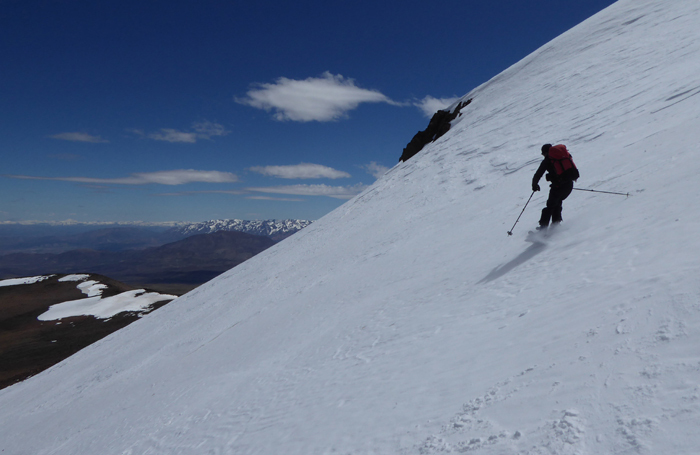 Skinning up Mururata, looking northwards to Huayna Potosi. Mururata proved to be a very interesting and beautiful mountain to do on skis.... and more or less the same view from the other end of the rope. David skiing down Mururata at about 5400m. The steep south face of Mismi from above Coporaque. We had hoped to do a new route on this face, but unfortunately after a week of bad weather everything was swamped by knee or thigh deep powder snow! 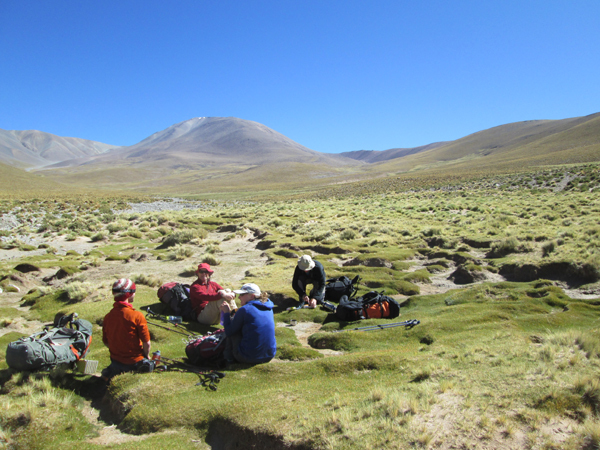 2011 - A very successful first ascents trip to the Puna de Atacama in November. We made first ascents of three peaks in the Cordon de los Pioneros, as detailed in the American Alpine Journal, 2012, p.175-176. 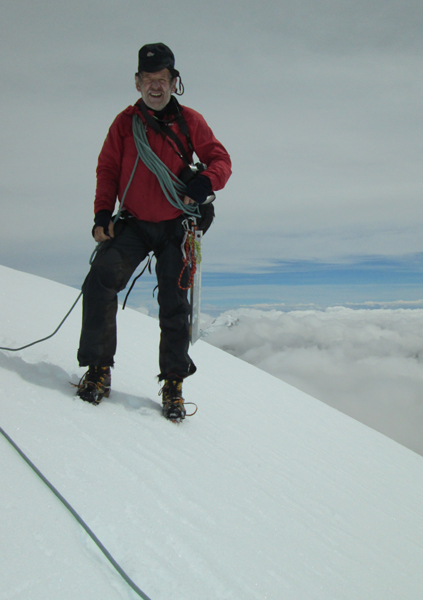 2010 - A first ascent in the Puna de Atacama of Medusa NE, an unclimbed 6046m high peak. 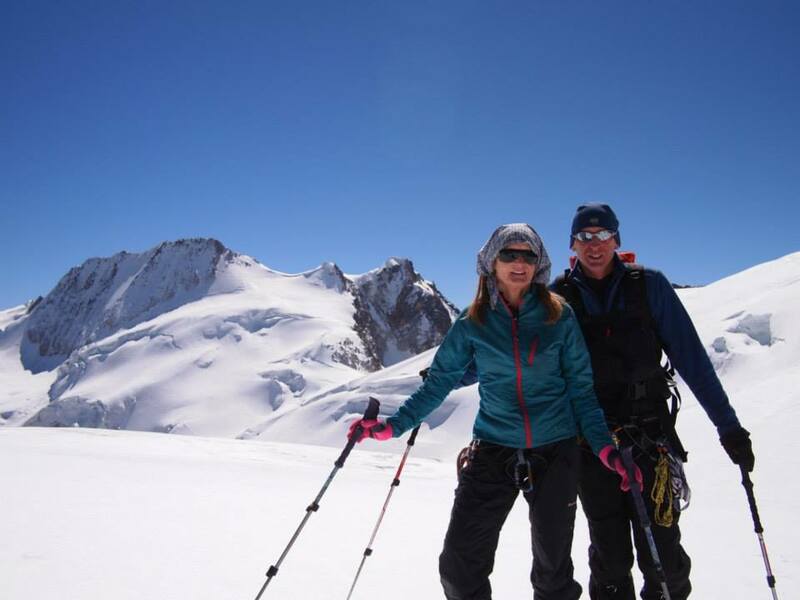 2009 - An exploratory ski-mountaineering trip to various areas in northern Argentina, including the Cordon del Plata and Agua Negra areas. 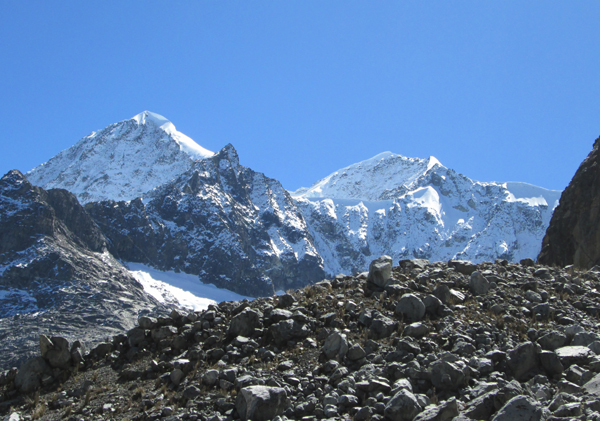 2008 - An attempt on an unclimbed 5000m peak in the Cordillera Blanca of Peru was not successful. The peak is still unclimbed as far as we know! 2007 - Another successful "First Ascents" trip to the Cordillera Vilcanota in August 2007, led by Spanish guide Pere Vilarasau. 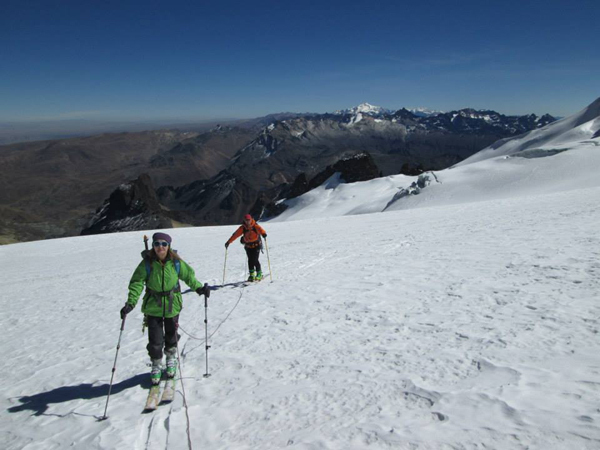 2006 - Our first ski mountaineering trip based in Argentina was successful on Volcan Domuyo. Indeed we may well have made the first ever ski descent of this 4709m peak which is often considered the highest peak in Patagonia! 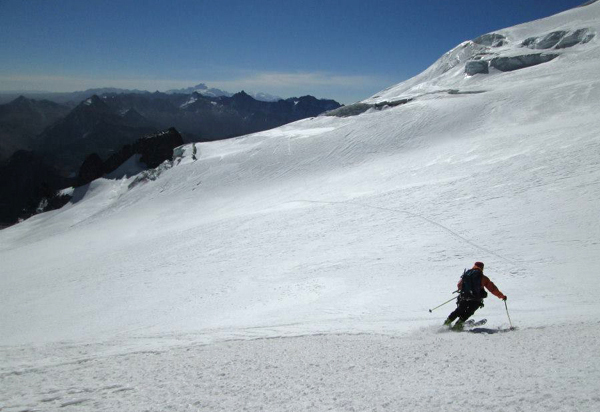 2005 - Exploratory ski mountaineering trip to Patagonia, including an ascent of the rarely climbed San Lorenzo 3706m. 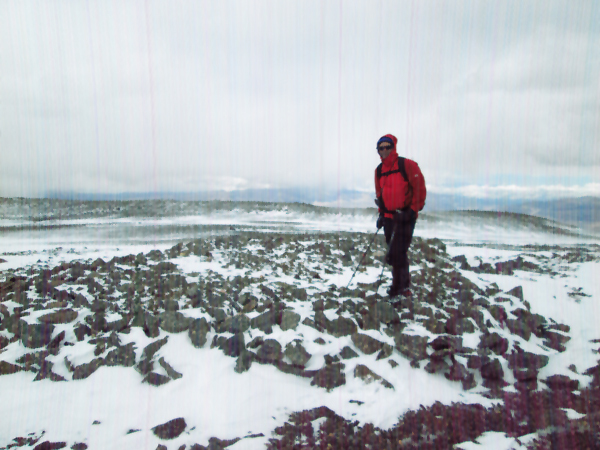 2004 - Expedition to Mercedario, the rarely climbed little sister of Aconcagua. 2003 - First ascents trip to the Cordillera Apolobamba in Peru made several first ascents and climbed new routes on established peaks. 2002 - First Ascents expedition to the Cordillera Apolobamba of Peru, where we made a number of first ascents despite poor weather. 2001 - Our first trip to Colombia. Despite the bad press it's a really friendly destination with great 5000m peaks. 2000 - Our First trip onto the South Patagonian Ice-cap and ascent of Volcan Lautaro 3580m, a very remote and rarely climbed peak. 1999 - Our first ski-mountaineering expedition to Chile. 1999 - Our first 'First Ascents' trip to southern Peru was successful on a number of high peaks in the Cordillera Vilcanota. 1998 - Pioneering trip to the Sierra Nevada of Venezuela, where we climbed Pico Bolivar. 1997 - Another groundbreaking trip into the remote Puna de Atacama, this time to attempt Bonete. First ascent of p.6144 to the north of Bonete. 1996 - First British Ascent of Pissis 6795m, the third highest in the Andes. First ever ascent of Nacimiento del Jagüe. 1995 - Pioneering treks around the Huayhuash and Vilcanota including a number of peak ascents now in the 'standard' itineraries of all our competitors! 1994 - Our 'Monster Descent' bike trip, a pioneering descent form over 5800m to sea level by bike, way ahead of any other business! 1993 - Expedition to Tupungato, a rarely climbed peak on the Chilean border.